continuing to wrinkle out bugs and problems. But we have been hard at work at some significant innovations to TimeSite Pro as well. Timesheets are a core source of information for your business by recording what people are doing, how long they are working on various activities, and applying cost and bill rates to this information so that you can see where you have incurred costs, and revenue is available to be invoiced to your customer. You are then able to see where your profits (and losses) are coming from. We want to be able to share this timesheet information easily with other applications as well as enabling you to establish seamless and efficient workflows to support your timesheet capabilities. We have previously mentioned our development work on our API capabilities. This capability is now available for you to use. Our application integration capability comes in three flavours: API keys, webhooks and Zapier integration. API keys enable you to access and retrieve information stored in your TimeSite Pro account as well as update this information. For example, you can build an integration that lets you create a Client record in TimeSite Pro when you add a new client to your CRM system. You can access timesheet records in TimeSite Pro and store them in your project management system for budget to actual comparisons. Webhooks are used to alert another application of a change in status to information stored in TimeSite Pro. For example, you can be informed that a client record has been created in TimeSite Pro and then use our API to access that record and add it to your accounting system. Both API keys and webhooks require a programming interface to be developed by your IT team. We would be delighted to talk to your technical team about how they can take advantage of these capabilities. 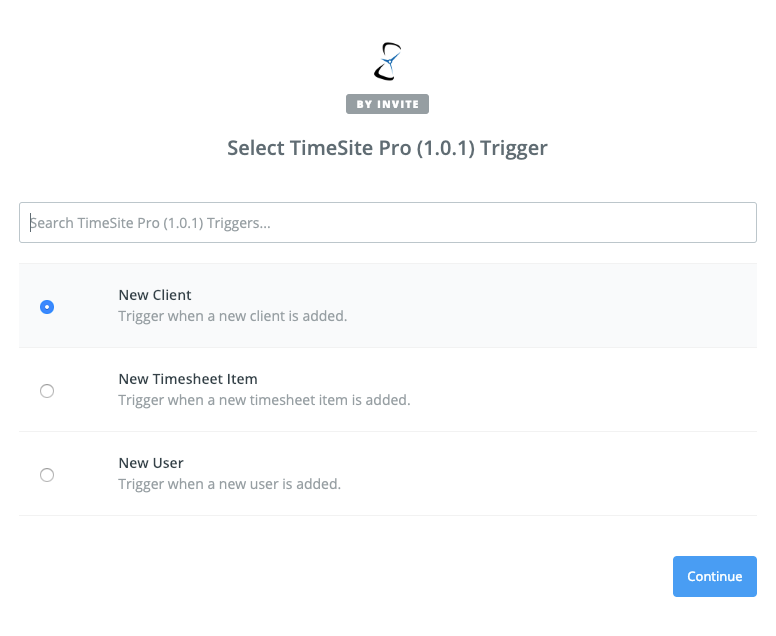 If you want to develop an integration with TimeSite Pro without the complexity of an IT coding project, then we suggest that you use Zapier to build a Zap that can integrate TimeSite Pro with literally thousands of other cloud applications that have also developed an integration with Zapier. A simple Zap might be “triggered” when a new Project is added to TimeSite Pro that sends a message to your installation team via Slack. Zaps can include conditional logic, multiple paths, additional functions, and a variety of different actions associated with various cloud services. 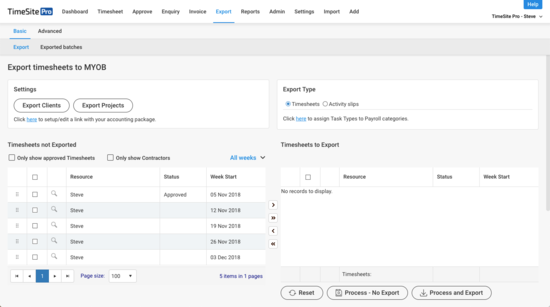 In addition to the work that we have been doing on our integration, take a moment to review our changes to our timesheet export features, especially our Advanced Export feature that we discussed in our last announcement. This feature enables you to export Client and Timesheet data for use in your invoicing solution. We have continued to work on our GPS, geofencing and Kiosk capabilities in our mobile app. For example, you can directly access GPS location from a timesheet record when you are approving a submitted timesheet. You can also easily monitor your staff location when they clock-on via our Kiosk on a tablet device via the Dashboard > Kiosk widget. The current version of our mobile app on both iOS and Android devices is 1.6.11. Please make sure that your staff turn on auto-update on their mobile devices so that they are always using the current version of our app. The Approval workflow has received many improvements over the last couple of months. You can access the GPS location attached to the timesheet record, you can see whether the timesheet has been used in an invoice, you can notify a user that their timesheet has been approved or sent back to them to be resubmitted, attachments can be viewed, and a pop-up panel will show the approval status of a timesheet. We have also added Timesheet Approver and Timesheet Approval Status to the Enquiry Group and Total fields. adjust billable hours and units in both the WIP and the Invoiced screens. We have improved the Settings and Actions pulldown in the Invoiced screen as well. There are some more enhancements to come in the next few weeks as well. Finally, we have released the first version of a new product called TimeMate. TimeMate sits on your desktop and logs your time spent on different activities during the day. It stops logging time when you are away from your computer. You’ll have a record of all the actions you have performed at the end of the day, week or month. TimeMate integrates with TimeSite Pro by adding timesheet records directly into your timesheet. We encourage you to download and install TimeMate on your Windows 10 desktop and try it out. We are keen to get your feedback via an email to support@timesitepro.com. We’ve just released our last major build for 2018, and we’re very excited about many of the enhancements included in this release. Our hard-working development team have been… well, hard at work on both our web server app and our mobile apps for smartphones and tablets. Let’s start with the key new feature that we’ve released for our web interface. The first thing you will notice when you open our app in your browser is a new main menu option: Export. The timesheet export to payroll function has long been hidden in the Admin screen. We felt that it was time to bring this core feature into the sun and integrate it with the functionality previously found in the Process Time screen. These two functions were complementary in that they both allowed you to export timesheet records to payroll and other systems. We felt that it was time to feature them together on our main menu bar. You can enable the Advanced features of this new Export screen in Settings > Export Timesheets > Export options. Refer to the help article, Export Timesheets, for more information on this feature. This enhancement also represented our opportunity to enable the separation of our integration with payroll and accounting systems. You can now export timesheets to your payroll system, and then export invoices to a different accounting system. While we’re on the subject of integration, you might like to have a look at the progress we’ve made with our API. You can find a link to the documentation of our API functions at Settings > Integration and click on the Documentation link. This will enable you to explore our timesheet and user record integration. New integration features will be progressively rolled out and included in this documentation site. We have also completed the rollout of our new Kiosk feature in our mobile tablet app. We mentioned this feature in our last release announcement, and it’s now complete. Once you’ve enabled this feature in Settings > System Settings > Features > Kiosk, you can set a Kiosk PIN for your users. 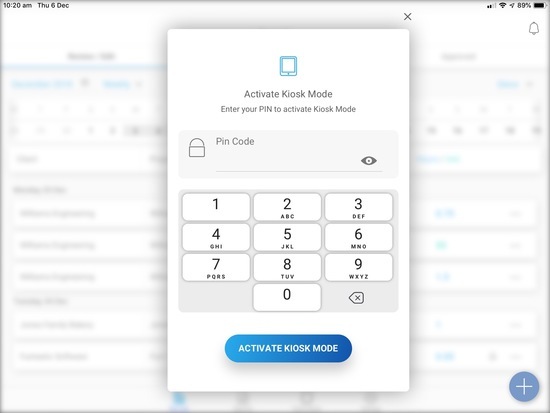 This PIN allows a supervisor to set their tablet into Kiosk mode enabling other users to enter their unique, individual PIN and then clock on when they arrive for work or commence a new job. When it comes time to clock off, they return to the Kiosk tablet, enter their PIN again, and clock off by entering the details (project and task) of the work they’ve just completed. Users can clock on and off multiple times per day. There’s a new Dashboard widget that allows you to keep track of which users have clocked on and where they are. Check out the new help article, Mobile App: Kiosk Mode, explaining this enhancement. While we are talking about our mobile app, we have also completed the development work on our geofencing and notifications features. You can set an address and boundary for a project or job worksite and users will be reminded to clock in and out when they arrive or depart from that site. You can specify that users will be automatically clocked on and off from the project as they cross the geofence boundary. This build includes many new features too numerous to include in this brief announcement. I encourage you to have a look at our detailed knowledge base article on the specific features included in this release. You’ll also find links to new and expanded help articles on the many features of TimeSite Pro included in this build. As is always the case, we’ve released many “quality of life” improvements to TimeSite Pro that we hope you’ll enjoy. We offer a sincere thank you to all of our customers who’ve submitted excellent enhancement requests to our development team. We highly value the input that we get from our customers about ways to improve TimeSite Pro’s features, and we’ll continue to carefully evaluate all your enhancement requests as they arrive at support@timesitepro.com. We wish you all the best for the holiday season and, like you, look forward to a wonderful and productive 2019. Another key feature that has been requested by a number of our clients is integration with single sign-on authentication providers. We have rolled out support for Google, Facebook and LinkedIn enabling your users to sign-in to TimeSite using their Google, Facebook or LinkedIn id. This feature is enabled on a provider basis in Settings > System Settings > Features. We’ve also added the ability for our clients using Microsoft Office 365 to use LDAP via SSL to meet their SSO requirement. System Settings now allows both default Country and State to be set. These defaults will be used when creating new records that have country/state fields. We have received valuable feedback from our customers regarding their use of smaller laptop screens and so we have implemented a new “Smaller Screen” option that will optimise the number of timesheet rows that can be displayed. Both the Timesheet Setting and Quick Settings menus how show thumbnail images of the different screen designs aiding the selection of your preferred timesheet layout. We continue to improve our integration with MYOB Online ensuring that the linking process is more robust and implementing an improved capability to automatically set up the connection to MYOB Online. This will also improve the way that we can link with various MYOB record types including Jobs, Activities, Clients, and so on. Notices will soon be able to be sent to users via both emails and SMS messages; we will be extending these capabilities progressively over forthcoming releases. Charts and Reports in the Dashboard panel now include a Print option. Reports can be further customised to match your requirements. We have released an update to our smartphone and tablet app to crush a couple of bugs that we missed. Please update to version 1.3.11 as soon as you can. We’re really excited about the positive feedback we’ve been receiving about our new design style. Our designers are thrilled at the impact they are having on our development team. We continue to seek your input though. If you have any suggestions or requests on how we can continue to improve either our functionality and our look, please don’t hesitate to send a message to us at support@timesitepro.com. You can find more information on the 11 Feb 2018 build in our Knowledge Base.